All students, grades K-8, who live more than two (2) miles from the school they attend, may be eligible for transportation or a subsidy. There is no transportation for open enrollment students - NO EXCEPTIONS. Bus stops and eligibility may be obtained by calling your school (except those inquiring about METRO bus passes). 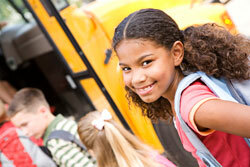 Grades K-8: More than two miles, Yellow Bus Service is preferred. Grades 9-12: The Central Registration/Bus Passes office will contact eligible students in grades 9-12. Eligibility requirements are based on the parent/guardian’s address to the student’s homeschool. METRO line service rates are the same for students and adults. METRO bus passes for eligible students: Call Central Registration/Bus Passes at 330.761.2961 (Merge Freeman) regarding eligibility. Pass prices are subject to change during the school year. Parental reimbursement: Families are only eligible if the student lives more than 2 miles from the elementary or middle school and no METRO or yellow bus is available. Parents of eligible students should be sent a contract that must be filed with the Transportation Services office – 330.761.1390. Address changes: Change of address may take 3-5 school days after the Transportation Department receives it for service to begin at the new address. Report to the school secretary (if riding yellow buses), for students who ride yellow buses or who receive an Akron Plan METRO bus pass. Report address changes for Special Education students who ride yellow buses, vans or taxis to Special Education – 330.761.3154. Addresses must be updated in the student database in order to schedule transportation.